New York’s voting and registration laws have long been derided as onerous and needlessly restrictive, falling far behind most other states that have implemented modern methods to register and cast a vote. While significant changes to state election laws are being debated in Albany ahead of a new state budget, the New York City Board of Elections may improve, albeit incrementally, people’s access to the ballot by soon providing digital aid to register to vote. The Board of Elections, a quasi-state agency funded by the city, is set to roll out a new website in the coming months which will provide New Yorkers with an “electronically assisted way” to fill out a voter registration form and an absentee ballot application, according to BOE Executive Director Michael Ryan, who testified at a budget hearing of the City Council’s Committee on Governmental Operations on Monday. The two electronic forms would still have to be printed and either mailed to the BOE or delivered in person, in accordance with current state law. The City Council last year passed a law mandating that the BOE implement online voter registration and, in mid-2016, mandated that the BOE create an online voter information portal where New Yorkers can track their absentee ballots, check their registration status and voting history, as well as access other voting and election resources. Both bills were sponsored by Council Member Ben Kallos, chair of the governmental operations committee last Council session. The BOE has often been reluctant to abide by local laws, since it is governed by the state, and has either implemented common-sense measures that do not necessarily require legislation or has been pushed to do so by litigation. Ryan reiterated that fact Monday, setting aside the “mandate-no mandate argument” and laying out the BOE’s plans for this year. He also explained why the BOE had been slow to implement those measures, when Council Member Kallos sought answers about the delay. The BOE was poised to launch a new website prior to the 2016 election, Ryan said, but was discouraged by its cybersecurity team, which warned that the new platform would require more “robust testing” before going public. The federal lawsuit also required the BOE to overhaul it’s software for processing election results. Ryan anticipates the launch of the new website in the second quarter of this calendar year, with the voter-registration assistance being mandated by the federal government. He also said the BOE’s voter information portal was “pretty far along” in development. The implementation delay did, however, fortuitously save the Board some effort, Ryan said. In that time, the United States Postal Service launched its own absentee ballot tracking service which they could now implement. “I would envision that since the postal service has already done it, assuming it works, and we’ve been told that it does, that we will help to advertise that so that the folks who really want to track their ballot can do it in a way that the post office can guarantee,” he said. Ryan’s promise of the new website came out of larger testimony about the BOE’s budget for the 2019 fiscal year, during the hearing led by Council Member Fernando Cabrera, chair of the governmental operations committee. As with the last few years, Mayor Bill de Blasio’s preliminary budget underfunds the BOE at $95.1 million. Ryan projected the Board would need at least $137.6 million to fund its operations, which include conducting two citywide elections -- the state primary in September and the general election in November (June congressional primaries will fall in the current fiscal year, which ends June 30). De Blasio has repeatedly denied employing the “budget dance” practice that agencies had to go through under previous mayors but has continued to use that tactic for the BOE and a few others. In each year under his administration, the BOE receives full funding by the time the budget is adopted. De Blasio has had a contentious relationship with the BOE, and has been very critical of the board’s operations and management, calling for sweeping reforms to its structure and practices. While most reforms can only result from state legislation, de Blasio has had an ongoing offer of $20 million in additional funds for the BOE in exchange for several reforms to its operations. In his State of the City speech in February, de Blasio reiterated that criticism while announcing that he’d convene a Charter Revision Commission that could, among other things, “empower the city government” to handle some responsibilities of the BOE, including voter outreach. At Monday’s hearing, Ryan pressed a number of different needs for the agency, including more funds for cybersecurity and higher pay for poll workers, which must be approved by the state or through executive order of the mayor. He also pressed the need for electronic poll books, which 34 other states and the District of Columbia have already implemented. Without electronic poll books, Ryan said same-day voter registration is “absolutely impossible” and early voting would be “difficult to implement,” at the least. Both reforms have been considered in Albany for years with little success but leading Democrats, including Mayor de Blasio and Governor Andrew Cuomo, have reiterated their support for the proposals this year. 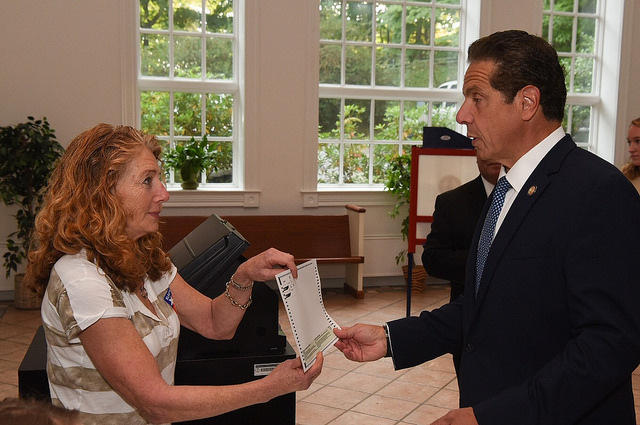 Cuomo, who is currently leading state budget negotiations, put $7 million for early voting in the amendments to his executive budget plan earlier this year. Last month, the New York City Council passed a bill that provides for online voter registration for city residents without requiring DMV-issued identification. With guidance from Attorney General Eric Schneiderman’s office allowing local jurisdictions to pass online registration measures, the bill holds up under state law. But state elections officials can’t agree on the validity of the bill, and city Board of Elections officials have yet to make a decision, portending that the matter may have to eventually be decided in court. The uncertainty is unfolding as Mayor Bill de Blasio is expected to soon sign into law the city bill, Intro. 508, the lead sponsor of which was City Council Member Ben Kallos. The question at hand is whether the city and state Boards of Elections will accept online signatures as valid in registering to vote. As of November 1, per state BOE numbers, there are more than five million registered voters in New York City, but an estimated 700,000-plus eligible voters who are not registered, with more turning 18 years of age each year. Currently, the only agency authorized to accept online registration forms is the Department of Motor Vehicles, but only for people who already have DMV identification. The city bill would allow the New York City Campaign Finance Board to perform that role as well and would allow voters to submit electronic signatures matching their “wet” ink signature on paper. It would ease the process of registration for hundreds of thousands of New Yorkers, many from low-income communities of color who may lack DMV identification since they depend on public transportation. 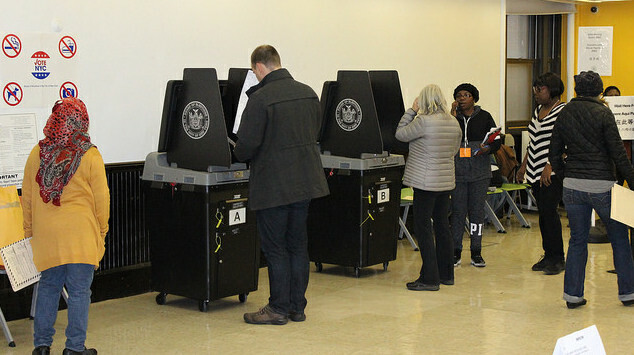 Following the bill’s passage, the New York City Board of Elections sought guidance from its parent body, the State BOE. But the Democratic and Republican state BOE commissioners reached a split verdict. In separate memoranda sent to the city Board earlier this week, the Democrats approved of the bill while the Republican commissioners questioned its validity. Valentine particularly noted that authorizing the city’s municipal identification program, IDNYC, as a signature repository “raises numerous issue in its own account.” “Specific research would need to be done to ensure that this program and any other so referenced, actually has strict safeguards and identification requirements to ensure that those applying for identification are, in fact, the individuals themselves,” he wrote. The memo pointed to A.G. Schneiderman’s informal opinion issued to Suffolk County officials in April last year when they were considering implementing a similar system locally. “Indeed, such electronically-facilitated voter registration is, in our opinion, consistent with the expressed legislative policy of ‘encourag[ing] the broadest possible voter participation in elections,’” Schneiderman wrote at the time. The bill provides “sufficient authority” to the Campaign Finance Board, he continued, to implement the law in a way to avoid conflicting with election law, including choosing how signatures can be submitted. “As caselaw evinces, the law defining signature has never been rigid, and Int. 508-A is precisely the type of practical extension of the law of signatures to new realities that changing modes of writing require,” he wrote. Kellner said the city BOE could decide to accept or reject electronically submitted signatures. The city BOE, as with its state counterpart, is a bipartisan body with ten commissioners, a Democrat and a Republican from each of the five boroughs, nominated through the party establishments. However, if they deadlock on processing such a registration form, under state law it would automatically be accepted. As New York State’s archaic election and voting laws continue to dampen voter turnout, the New York City Council is about to take a step to encourage participation. The City Council’s governmental operations committee will vote on Tuesday, November 14 to approve a bill allowing online voter registration for city residents, Council Member Ben Kallos, chair of the committee, told Gotham Gazette on Thursday. The bill is then expected to pass the full City Council on Thursday. “With the historic low in turnout on Tuesday, online voter registration will be an essential tool to help more residents become voters,” Kallos said in a phone interview, referring to the 22 percent of registered voters who showed up to the polls to vote for mayor. Following the committee vote, the bill will head to the Council floor for a vote at its next stated meeting, he said. New York’s laws lag behind most other states and voter turnout has been consistently low in recent elections at the federal, state and city level. Nationally, 34 states and Washington D.C. allow some form of online voter registration. Although New Yorkers can submit registration forms online through the Department of Motor Vehicles, only those with DMV-issued identification can do so. “Many people in urban areas, which have higher concentrations of low-income communities of color, may not have drivers licenses because they rely on public transportation,” Kallos said. Kallos’ bill requires that the New York City Campaign Finance Board, or another agency designated by the mayor, create a website and mobile application where residents can register to vote or update their registration. The agency will have to submit those registration forms to the Board of Elections within two weeks, and the portal will inform applicants when their registration will go into effect. The online form will allow applicants to either upload files with a copy of their handwritten signature, a photo for instance, or directly sign the form using a touchscreen. “I think it’s long overdue and it’s good to see the City of New York join the 20th century,” Kallos said, hinting that the state’s voting laws require broader modernization. While online registration would make registering easier, to significantly improve turnout -- millions of registered New Yorkers do not vote in local elections -- many point to state-level reforms, such as early voting and same-day registration, which have stalled in Albany, curbed by the Republican-controlled state Senate. Kallos, a Democrat who represents the Upper East Side, credited Attorney General Eric Schneiderman for paving the way for online registration through an informal opinion he issued in April last year. Schneiderman, who was responding to Suffolk County officials seeking clarity on voter registration requirements, wrote that a registration form completed with an “electronically-affixed handwritten signature” would be consistent with state law. Although the bill would take effect 18 months after it is signed into law, Kallos urged the de Blasio administration to move quickly. As a demonstration of the ease with which a portal can be created, he built his own fully-functional microsite, which he said took only a few hours. “I hope the city doesn’t wait years or months but gets it done in weeks, days or even hours,” he said, also hoping that every city agency integrates links to the portal in online forms, which isn’t mandated in the legislation.